The SureFire Picks to Click were powered by SureFire Ag Systems throughout the 2015 season. With our SureFire Picks to Click feature, we select six players or units from across the state each week that we felt would have breakout performances. We assembled a team of six media members to select one player (or unit) each week and tracked the cumulative statistics of our selections throughout the season similar to fantasy scoring. Bruna completed 11 of 13 passes for 239 yards and four touchdowns in the Wildcats’ 58-12 win over Lincoln. Bruna also added 44 yards rushing and three touchdowns on five carries. Horak had a big night on offense to lead the Bulldawgs to a 48-13 win over Clay Center. Horak carried 15 times for 248 yards and three touchdowns. He also completed 10 of 14 passes for 147 yards and two more touchdowns with one interception. Friend rushed for 195 yards and three touchdowns and completed 6 of 7 passes for 165 yards and two more scores in the Cardinals’ 66-21 win over Leoti-Wichita County. The workhorse Peters carried 31 times for 206 yards and six touchdowns in the Mustangs’ 42-25 win over Goddard-Eisenhower. Byers led Bonner Springs to a 28-14 win over Eudora. The senior quarterback completed 17 of 31 passes for 246 yards and a touchdown. He also ran for 122 yards and two more scores for the Braves. Koch completed 20 of 26 passes for 277 yards and three touchdowns as the Jaguars beat then No. 5 St. James Academy, 45-14. Koch also rushed for 71 yards on 16 carries in the game. Walters completed 14 of 24 passes for 342 yards and three touchdowns for the Red Demons in their 37-3 win over Hays. Rudzik had another big night as the Tigers beat Liberal 38-19. 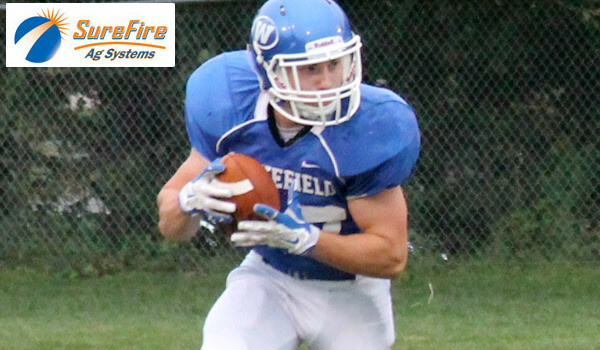 Rudzik rushed for 267 yards and four touchdowns for Ulysses. Urban rushed for 111 yards and six touchdowns as the Cougars bested Ness City, 58-20. He also passed for 35 yards in the Otis-Bison win. Frausto rushed for 203 yards and three touchdowns on 20 carries as the Mavericks beat Valley Center, 35-16. Korie also completed 8 of 14 passes for 54 yards and a touchdown pass to Jordan Maxson. Melius rushed for 241 yards and four touchdowns in the Bombers’ 48-0 win over Stockton. Injuries limited Melius to only five games and one play this season, but he still rushed for 1,276 yards and 24 touchdowns on just 80 carries. Walter completed five of seven passes for 139 yards and three touchdowns in the Leopards’ 50-12 win over Sylvan-Lucas Unified. He also rushed eight times for 119 yards and another score. Elston carried 15 times for 102 yards and four touchdowns in the Cardinals 45-18 win over Baldwin. The senior quarterback also passed for 53 yards and another score.